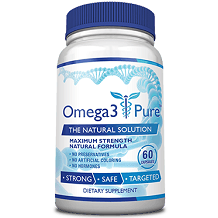 The following review is on Omega 3 Pure; a fish oil that is known to improve cardiovascular health, reduce inflammation, support cognitive health, and regulate mood amongst other health benefits. Endorsed by many medical practitioners, the producer is confident that their product is deserving of the title as the ‘Ultimate Omega-3 Supplement’. This supplement is comprised of 1500mg of Omega 3 fatty acids; taken from omega-3-rich cold-water fish such as Salmon, Herring, Mackerel, Anchovies, and Sardines. These capsules also include 800mg of Eicosapentaenoic Acid (EPA) and 600mg of Docosahexaenoic Acid (DHA) which have been clinically proven to promote great results of the nutritious Omega 3 supplements. The formula also includes 100mg of other Omega 3 fatty acids. This formula includes no fillers, binders, or artificial ingredients; making it 100% pure and natural. The manufacturer is also GMP-certified and abides by FDA recommendations, comforting customers that their product is of a superior quality and accurately concentrated. There are clear and simple instructions on the use of Omega 3 Pure supplements. Adults should take one (1) capsule twice a day with meals. For best results, one (1) capsule should be taken in the morning and one (1) capsule should be taken in the afternoon. Do not exceed the recommended dose as the concentration has been optimized for efficient results per suggested serving. There have been no noted side effects and pregnant or nursing mothers, those under the age of 18, and anyone with a pre-existing medical issue should – as with most changes in diet – consult a physician before use. This product is made of all-natural ingredients and is safe to use for long-term supplementary use. This Omega 3 supplement can be bought directly from the manufacturer’s website. For a single month’s supply of 60 capsules, customers can expect to pay $49,95. There are many package offers available on the website that extends great value and savings to prospective and returning customers. The most popular package is the 6 bottle supply for $139,70 – giving you a 6-month supply of Omega 3 supplements as well as significant savings for $280,00. These package offers make the long-term use of this quality product sustainable and affordable. The manufacturer showcases great confidence in their product, offering customers a 60-day day money-back guarantee. This applies to both opened and unopened bottles. There is additional peace of mind offered on the manufacturer’s website in the form of encrypted credit card protection that ensures online purchases are 100% safe and secure. 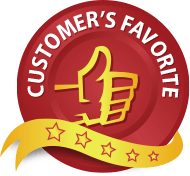 There are a variety of positive reviews on the Customer Health website that showcase product efficacy and customer satisfaction. Additional benefits were mentioned such a the lack of fishy aftertaste and an increase in concentration as well as a decrease in cholesterol levels. Omega 3 Pure by Consumer Health is an all-natural and quality product, earning the title of ‘Ultimate Omega-3 Supplement’. The formula is certified by strict cGMP guidelines and concentration matched the recommended potency for effective results. The product is affordable, especially when bought in a package and the product guarantee is extensive – offering potential customers peace of mind. This product seems to offer all of the benefits associated with a quality Omega 3 supplement without the inconvenience of a fishy aftertaste. Thus, we recommend this product as an Omega 3 supplement of choice.